Romanian is spoken by about 22 million people in Romania, where it is the official language, by 3 million people in Moldova (where it's called Moldovan), and by around 1 million scattered in Albania, Bulgaria, Greece, Macedonia, Montenegro, Hungary, and Serbia. 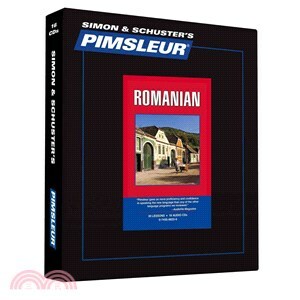 Learn Romanian today with Pimsleur. The PimsleurR Method: the easiest, fastest way to learn a new language. Completely portable, easily downloadable, and lots of fun. You’ll be speaking and understanding in no time flat! Romanian, Comprehensive includes 15 hours of spoken language practice and one hour of reading instruction in thirty, 30-minute lessons. In the first 10 lessons, you’ll cover the basics: saying hello, asking for or giving information, scheduling a meal or a meeting, asking for or giving basic directions, and much more. You’ll be able to handle minimum courtesy requirements, understand much of what you hear, and be understood at a beginning level, but with nearnative pronunciation skills. Reading Lessons are included starting in Unit 11 to provide you with an introduction to reading Romanian. These lessons, which total about one hour, are designed to teach you to sound out words with Romanian pronunciation and accent. A Reading Booklet to be used with the audio lessons is also included in PDF format.